Description: In 1944, as war rages across Europe and Asia, famine, violence and fear are commonplace. But life appears tranquil in the isolated farming settlement of Wapiti in northern Saskatchewan, where the Mennonite community continues the agricultural lifestyle their ancestors have practised for centuries. Their Christian values of peace and love lead them to oppose war and military service, so they are hardly affected by the war – except for the fact that they are reaping the rewards of selling their increasingly valuable crops and livestock. Thom Wiens, a young farmer and earnest Christian, begins to ask questions. How can they claim to oppose the war when their livestock become meat to sustain soldiers? How can they enjoy this free country but rely on others to fight to preserve that freedom? Within the community, conflicts and broken relationships threaten the peace, as the Mennonite tradition of close community life manifests itself as racism toward their “half-breed” neighbours, and aspirations of holiness turn into condemnation of others. Perhaps the greatest hope for the future lies with children such as Hal Wiens, whose friendship with the Métis children and appreciation of the natural environment offer a positive vision of people living at peace with themselves and others. 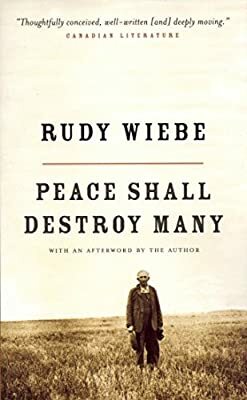 While Peace Shall Destroy Many takes place in a Mennonite community, its elements are universal, delineating the way young idealism rebels against staid tradition, as a son clashes with his father. In the face of violent confrontations between beliefs all over the world, the novel remains as compelling now as it was nearly forty years ago.